Every bedroom must have a chest of drawers it brightens up any space and adds the all important storage and organisation which everybody needs. 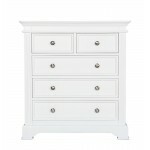 Make sure you get the right chest of drawers for you, with such an extensive variety there is a lot to choose from. 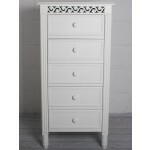 We provide the lovely white painted chest of drawers or the sturdy solid oak chest with crisp clean lines along with many others. Whatever space you have there will be one to fit. 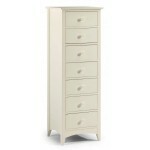 No matter what you have to work with in your home a chest of drawers are a welcome addition to any bedroom. 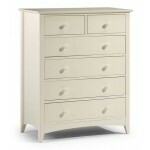 Chests of drawers are some of the most practical furniture items you may purchase for your bedroom. 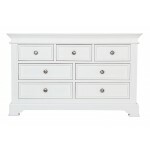 Here you can find a large collection of chests of drawers that will fit perfectly in the existing décor of your home. With so many available models, the process of choosing the right one for your home becomes a breeze. Thus, whether you are looking for a small addition for your bedroom or a large chest of drawers, you will find it at Dooley’s Furniture. 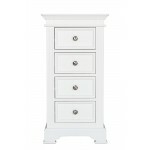 Not only do we offer a large selection of exceptionally well built chests of drawers, but we also provide our customers with several other bedroom pieces in the same ranges, in order to create an ideal balance for your room. 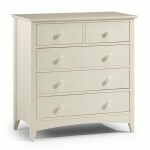 Shopping for Chests of Drawers Is As Easy As 1, 2, 3! 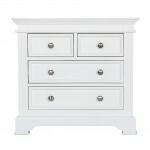 Shopping for a new chest of drawers should not take too long and it should definitely be a hassle-free experience. When you choose to shop online at Dooley’s Furniture, you can avoid all the hours spent in huge warehouses, hunting for the perfect pieces of furniture. Just browse our collection from the comfort of your home and we will have your preferred items delivered right to your doorstep. It really does not get simpler than that!